I'll be honest up front-- I tend to shy away from books by Christian psychologists or psychiatrists. There's just so much (in my opinion) garbage included in many of the Christian self-help offerings. The more books an author puts out, the more skeptical I am about what they have to offer. 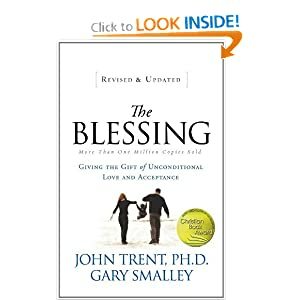 But I was given a chance to read the book The Blessing: Giving the Gift of Unconditional Love and Acceptance by John Trent and Gary Smalley thanks to the folks at BookSneeze. I typically don't pick up books like The Blessing, but I thought it could provide a helpful perspective on parenting. And,overall, it did. These are very good categories for any parent (Christian or non-Christian) to think through. The authors provided many illustrations from Scripture and real-life to illustrate their point. However, while I agree with the importance of the points they made, I disliked the way they used Scripture. I thought they were using Scripture to support their points instead of using Scripture to argue their points. It isn't that blessing and affirming our children is unimportant, it's just that I think they offered a poor biblical argument. Secondly, they had an over abundance of real life "sob stories" of people who failed to experience the blessing from their parents. This really killed the book for me. I honestly stopped reading after getting through the first two sections of the book, because I felt that they already got the point across. So, would I recommend this book? It depends on the level of discernment of the reader. I think there are better Christian parenting books out there. However, it's worth reading simply for the second section which goes through the five essential elements of blessing your children. I'd give it 3 out of 5 stars. Disclosure of Material Connection: I received this book free from the publisher through the BookSneeze®.com book review bloggers program. I am not required to write a positive review. The opinions I have expressed are my own. I am disclosing this in accordance with the Federal Trade Commission's 16 CFR Part 255: "Guides Concerning the Use of Endorsements and Testimonials in Advertising." Sounds like it had some good suggestions, especially for parents to keep in mind, but I'm glad to have read your review. I don't think I'll add it to my ever-growing pile of books to read!